There was gloom in the air Sunday evening at Toronto's Nathan Phillips Square. Members of Canada's Kurdish community had gathered to celebrate the "International Day of Solidarity with the people of Kobani," the Syrian city near the Turkish border where Syrian Kurdish forces last year inflicted a historic defeat on the Islamic State. Usually, thousands of Canadian Kurds rally to the call of such events. But this time there was a marked drop in attendance in the crowd, which initially gathered at the intersection of Yonge St. and Bloor St. to march to Toronto City Hall. That's because news had just come in that the Islamist AK Party of Turkish President Recep Tayyip Erdogan had swept to an unexpected victory in the snap election called in Turkey after polls in June resulted in a hung parliament, with no party capturing a majority of seats. On Sunday, Erdogan's AKP won nearly 50% of the votes, enough to form a majority government, thus ensuring five years of single-party, dictatorial rule, resembling the now ousted Muslim Brotherhood government of Muhammad Morsi in Egypt. Turkey no longer deserves to be a member of NATO. For Turkey's Kurds and those living in the diaspora in Canada, this news was devastating. They had hoped for an improvement in the share of the vote for the pro-Kurdish HDP (Halkların Demokratik Partisi) that in June had come from nowhere to win party status with 13% of the vote and 80 seats. But on Sunday, the HDP barely surpassed the 10% threshold, losing over two million of their June votes to the AKP. If there was any doubt about the authoritarian nature of the Turkish state, it was visible on the streets of Toronto as Turkish Canadian Islamists came in droves to taunt the Kurdish protestors, with chants of "Allah O Akbar" and hijabi women showed them their middle fingers and shouted slurs. As we marched to City Hall there was no let up by the Islamists celebrating their victory and flaunting their arrogance as dejected Kurds worried about the fate of their relatives in Turkey. 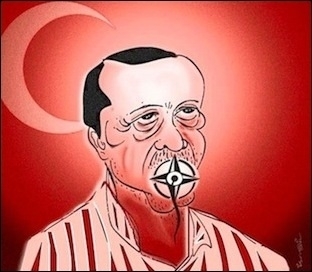 Leading up to Sunday's elections, Erdogan let loose a reign of fear and media censorship that, in the words of Ignacio Sanchez Amor of the Organisation for Security and Cooperation in Europe (OSCE), led to "restrictions on freedom of expression in general." In his assessment, Andreas Gross, head of the Parliamentary Assembly of the Council of Europe (PACE) delegation said: "Unfortunately, the campaign for these elections was characterised by unfairness and, to a serious degree, fear." The fears of Kurds and secular Turks are not unfounded. When he was the mayor of Istanbul, Erdogan said: "You cannot be both secular and a Muslim! You will either be a Muslim, or secular ... and why is that? Because Allah, the creator of the Muslim, has absolute power and rule." But even more alarming than Erdogan's contempt for the separation of religion and state is his declaration that, "Democracy is like a train: when you reach your destination, you get off." The question on the minds of most critics of Turkey's flirtation with Islamism is this: Now that Erdogan has absolute power, has he gotten off the democracy train or is his destination further south, towards the now abandoned Hejaz Railway to the Arab heartland as the head of a new caliphate? One thing is for sure. Turkey no longer deserves to be a member of NATO.